MSNBC - Worried About Bed Bugs in Your Hotel Room? It only takes one egg! Prevent bed bugs from entering your home when you travel using these eco friendly bed bug laundry bags. 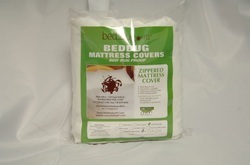 Bags seal in bed bugs and their eggs, preventing these common hotel pests from catching a ride home on your clothing. For extra protection from bed bugs, leave your suitcase outside and drop only the dissolving laundry bag into your washing machine. Check out the Returns Policy Page for more information our our Double Money Back Guarantee!